Penang's historic importance as a trading port means that there is plenty of shopping to burn out even the most die-hard of bargain hunters. From small boutiques and local markets to sprawling cosmopolitan malls, shopping in Penang is an obsession shared by both locals and tourists. For the non-shoppers getting dragged along, the famous street food in Penang will keep you happily distracted between giant megamalls. Penang has more than its share of ultra-modern megamalls for visitors who are not comfortable negotiating the smaller local markets. Penang's malls typically include several floors of familiar retail chains with independent shops mixed in. Do not let the fluorescent lights and Western environment fool you - competition is fierce and prices can still be haggled! Some of Georgetown's larger shopping malls are just outside of the tourist areas. KOMTAR: Officially named the Kompleks Tun Abdul Razak, the 64-story KOMTAR is Georgetown's most prominent skyscraper. KOMTAR was Georgetown's first real shopping mall and doubles as an important bus terminal for the city. Restaurants fill the bottom of the KOMTAR complex and a sky bridge connects Prangin Mall - one of the largest shopping malls in Penang. Prangin Mall: Prangin Mall occupies a large block adjacent to the KOMTAR complex. Often full of Georgetown's youth looking for trendy clothing, busy Prangin Mall is five floors of bargain hunter's paradise. An arcade and cinema occupy the top floor. Little India and Chinatown: If the gigantic shopping malls become tiresome, head out to Lebuh Campbell, Lebuh Chulia, and Lebuh Pantai for a change of scenery. Wandering the boutiques and small shops of Little India while Bollywood music thumps from sidewalk speakers is a unique shopping experience. Mamak restaurants making hot teh tarik and street vendors selling Malaysian noodle dishes ensure that you will have the energy to keep walking. Chowrasta Bazaar: The original Chowrasta Bazaar was built in 1890. Known as the famous "wet market" on Penang Road, the Chowrasta Bazaar sells fish, food items, and lower quality goods such as clothing. Nutmeg and other local spices can be purchased here as gifts for far cheaper than at the tourist-oriented markets. A great collection of second-hand books can be found in shops upstairs above the market. Gurney Plaza: Gurney drive just northwest of Georgetown is mostly famous for a wide variety of street food, however, Gurney Plaza is home to one of Georgetown's swankiest malls. A full day can be made of shopping at Gurney Plaza then walking the seaside esplanade at night to sample all the glorious foods. Midlands Park Centre: Located on Burmah Road in Georgetown, the Midlands Park Centre has 350 retail stores inside and even a bowling alley for taking a break between shops. The Midlands Park Centre is a great place to go for cheap DVDs, computer accessories, and electronics. Not all of the shopping in Penang is centered around Georgetown - grab one of the city's easy Rapid Penang buses for access to other areas. Batu Ferringhi Souvenir Shopping: The tourist esplanade in Batu Ferringhi outside of Georgetown transforms nightly into an outdoor bazaar with cheap souvenirs, food, and tacky keepsakes. Stalls set up around 6 p.m.; haggling is essential for getting any good deals. If making the trip around the island to Batu Ferringhi, consider a stop at Balik Pulau, Kek Lok Si, or even the Penang National Park. Island Plaza: The Island Plaza shopping strip is located between Georgetown and Batu Ferringhi. Considered a "notch above" other malls, the Island Plaza's prices cater to shoppers with higher taste. Queensbay Mall in Bayan Lepas: Just outside of Georgetown, not far from the famous Penang Snake Temple, is Penang's longest shopping mall. Queensbay Mall is a modern, enormous entertainment complex with dining and 2.6 million square feet of retail space. Batik Fabric: Colorful and cultural, these pieces of cloth make light, versatile gifts to bring home. Look for batik fabric deals around Teluk Bahang - where many are made - as well as in shops on Penang Road and at the nightly tourist bazaar in Batu Ferringhi. Fine Jewelry: Southeast Asia has more than its share of gold and gem shops. Find the reputable shops in Georgetown centered around Lebuh Campbell and Lebuh Kapitan Keling. Antiques: Georgetown's role as a major trading port means that many artifacts and antiques from all over the world are still waiting to be discovered in dusty antique shops. Check the cluttered shops around Jalan Pintal Tali and the Lorong Kulit flea market for lost treasures. Art: Patronize the large assortment of galleries and shops around Jalan Penang and Lebuh Leith for batik paintings and interesting works of local art. 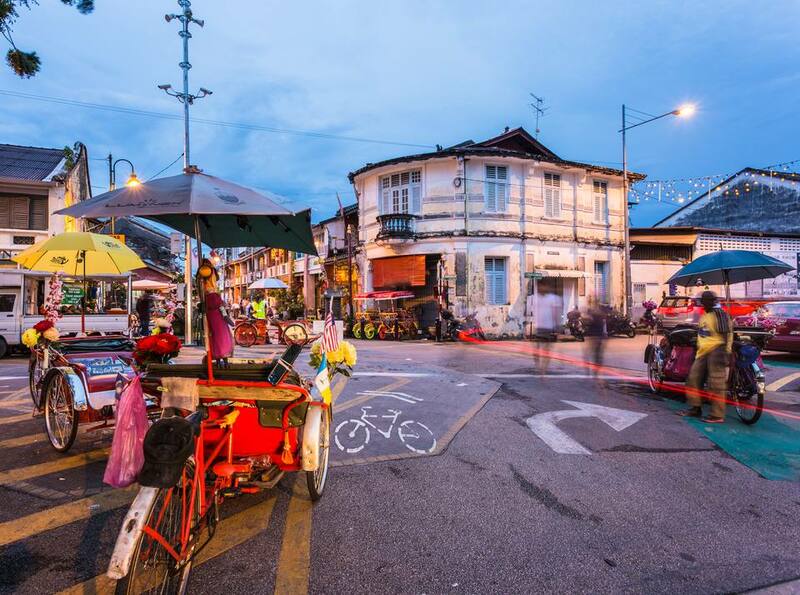 Upper Penang Road in Georgetown comes alive on the last Sunday of every month with a crowded art, craft, and souvenir market. Exhibitions, demonstrations, and delicious Malaysian Indian food complement the more than 70 stalls. The street is pedestrianized; the market begins around 10 a.m. and finishes in the evening. Although a strange concept for Western shoppers, nearly every price found while shopping in Penang can be negotiated. Bargaining is a way of life for the vendors, they both expect and enjoy to haggle. Never be afraid to ask for a discount, particularly if buying more than one item!